Nikko is a small town north of Tokyo. 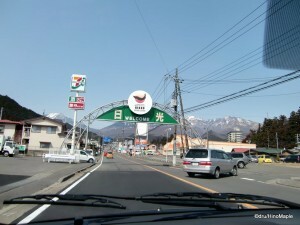 It is a famous destination for tourists, both Japanese and foreign. Located about two hours north of Tokyo, it is a good day trip if you are spending a couple weeks in Tokyo. It is also a good place to escape the city and enjoy nature. Nikko is famous for being a UNESCO World Heritage site. There are four main temples to see within Nikko, and a side trip to Lake Chuzenji. Ultimately, you don’t have to go to Lake Chuzenji, but it is a very nice, relaxing, place to visit. Deciding which temples and shrines to visit isn’t a difficult task. They are all within a short walking distance of each other, and buying a ticket to visit all of them is strongly advised. From Nikko Station, I would highly recommend taking a local bus up to the shrines. This will take you to Toshogu. This is the main shrine, but, to be honest, it is a bad location to start. I would personally start at Shinkyo Bridge. This is a small wooden arch bridge that connects the modern Nikko, including the station, with the UNESCO sites. Unfortunately, I believe there isn’t a bus stop in the area. If you are up for the walk, it’s about one kilometre from Nikko Station to Toshogu. 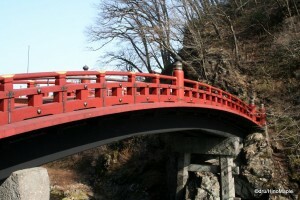 From the bridge, you’ll be able to visit a small shrine, but beware. There are steps leading from the side of the bridge to head up, but I was advised to head around. I never made it to this shrine because of a lack of time, but if you skip going to Lake Chuzenji, this would be a nice place to visit. The first recommended temple to visit is Rinnoji. 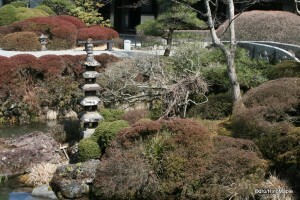 From here, I would start at the gardens that are located opposite of the main temple. The gardens are very beautiful, even in the winter. While it is relatively small, and you can finish a quick walk through in about 15 minutes or less, the tranquility should be enjoyed. There are various plants and lots of coy within the pond. The moss covered gardens are also very beautiful and meticulously maintained. The groundskeepers literally remove any debris and bad moss with toothpicks during the day. I couldn’t imagine doing this work everyday. While you are in the garden, there is also a small building holding a few artifacts. I wouldn’t recommend this as most of the artifacts are in Japanese. However, if you are visiting on a hot summer’s day, this would be a good escape from the heat. Rinnoji itself is also magnificent. The temple isn’t that big, but inside, there are 3 large gold statues. You will be able to see Amida, Senju-Kannon, and Batō-Kannon. I didn’t find it particularly interesting, but there was a Japanese guide giving explanations of the statues every so often. Unfortunately, I couldn’t understand it enough, so I didn’t bother staying. Towards the exit, you can also buy a few lucky charms based on your birth animal. Note: This is Part I of a II part series. Please continue to Part II of this series. This entry was posted in Kanto and tagged Amida, Bato-Kannon, Chuzenji, coy, japan, Japanese garden, Lake Chuzenji, moss, nature, Nikko, Nikko City, Nikko-shi, Rinnoji, Senju-Kannon, Shinkyo, Shinkyo Bridge, Shinkyo-hashi, shrine, temple, Tochigi, Tochigi-ken, Toshogu, UNESCO, UNESCO World Heritage Site, World Heritage, World Heritage Site by Dru. Bookmark the permalink.